Something that I am finding to be more and more true as I live life and take on new projects is that success is not about how MUCH you have, it’s about using WHAT you have to it’s greatest potential. You may have an incredibly large store front with the resources and possibilities that never end. But… most of you probably don’t have those things. The best you are working with right now is a 10 x 10 storefront sandwiched in between a Jamaican patty place and a Dunkin Donuts. What, then, can be done to really show the world how much your business means to you? What steps can you take to get the attention of every passerby and pull them in? Well, let’s talk about that. I’ve put together list of five things you can do to liven up your storefront and attract more customers. Let’s go! 1) Keep it clean! The simplest of tasks can really help you attract more customers. When your storefront looks dingy, chances are people are going to assume that the inside of your store looks the same as well. 2) Regularly Wipe off your main signage. This goes along with the first one. 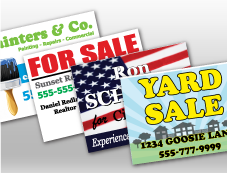 Keep your signs clean, and they will last longer, saving you money! 3) Give your walls a new paint job. If your landlord allows, paint your storefront. Chances are, this will separate you from your neighbors and help you stand out more. 4) Provide your customers with updates before they even walk in. Keep a sign on the door or next to it that has regular updates on store news, products and promotions. 5) Give your storefront a personal touch. Add some potted plants, a few chairs or a bench. This turns your place of business into a peaceful, welcoming setting that allows your customers to interact outside of a transaction. Cracker Barrel does a great job using this technique by keeping rocking chairs on their front porch. They provide a way for their happy guests to sit and relax after their meal, and can become a purchase as well.